Natalija Konstantinović was born in Trieste (Italy) 1882 as the daughter of Alexander Konstantinović and Milena Opuić. She was descended from the Obrenović dynasty which had ruled Serbia for the most part of the 19th century. She became Princess of Montenegro as the wife of Prince Mirko Petrović-Njegoš. They married in 1902. The couple had five sons; however, two died in early childhood. They divorced in 1917, a year after the royal family was forced to flee the kingdom. Princess Natalija secondly married, in England, count Gaston Errembault de Dudzeele (1877-1961). They had two daughters, Hélène (1921-2006) and Anne-Marie (1922-1984). She was very close to the Italian Royal Family. She spent many summers with Queen Elena of Italy and King Victor Emmanuel III., She was called Aunt Lily, and the sons were called MIKI, POLI, and Emmanuel, named after the King of Italy. In 1913 Natalia and sons arrived in Italy and stayed there until the end of 1914 with the Royal Family, after I don’t know where they went, but in 1917 they were again with the Queen in Piemont (Sant’Anna di Valdieri). Natalija died in Paris on 21 August 1950 at the age of 67. The Italian passport (V.E. 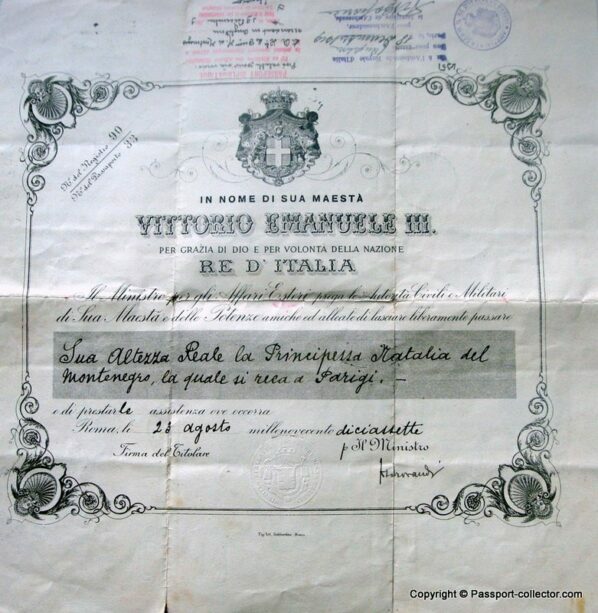 III) issued 1917 in Rome to Princess Natalja of Montenegro shows her journeys to France, Switzerland, Italy, England and Belgium, around 30 visas, including 7 diplomatic visas – e.g. from the Swiss Legation in Rome, 1919, format 45 x 45 cm, 2 times folded, small holes at the folded areas, also at the blind stamped Italian seal but all in in very good condition. Géraldine Cerf de Dudzeele is a relative of Princess Natalja and contacted me after she saw my article online. The passport went back to Géraldine, and she gave me further valuable information which you can read below. My grandmother was forced to her first marriage with Prince Mirko Petrovic-Njegos for the sake of political aims concerning Serbia and Montenegro. At that time, she was in love with her future second husband, my grandfather, Gaston Errembault de Dudzeele, who lived in Belgrade with his two sisters because his father was the Belgian ambassador to Serbia (1890-1898). Her husband made her unhappy because he did not treat her well, and moreover, he had tuberculosis. Thus, her first two sons died of tuberculosis at 5 and 3 in 1908, just a few months before the birth in September of the same year of her third son Michel (called Micky). Then, two other sons were born, Paul (Poli) in 1910 and Emmanuel in 1912. She married the Count Gaston Errembault de Dudzeele in 1920, and she gave birth to Hélène in 1921 and Anne-Marie, my mother, in 1922. They lived first in Paris, then in England. The three boys were in a boarding school in England, but they also had to go to the hospital because they all had tuberculosis. She came back to France at the beginning of the WWII. Emmanuel died in March 1928 and Paul in June 1933. Paul died in the hospital Saint-Joseph in Paris which is 50 meters from a psychiatric hospital where I work. Micky was the only one who survived his tuberculosis. He had one son, my cousin Nikola Petrovic-Njegos, Crown Prince Nicolas II of Montenegro. During the WWII, Micky refused the offer of Mussolini to take back the throne of Montenegro as he was a king in exile since his father’s death in 1917. My grandmother’s second husband finally made her unhappy also because he had a complicated character. 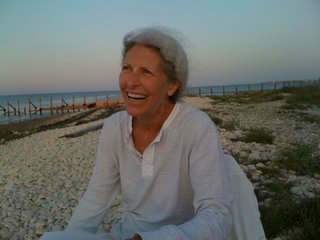 Nathalie was a beautiful woman with strong moral and democratic principles and very courageous. She was very gifted. She always had a lot of burdens as she lived through exile, the loss of four children, etc… but still stood upright in her entire life. She has always has been an icon for us because of all this mixing of private history and public history and because of so many misfortunes which are not without effects on the following generations. I had always wanted to approach this past in a way permitting to get out of a sort of myth, of an untouchable, fixed history, which is the case mainly when a lot of traumatisms took place. I think acquiring this passport is related to that. After having been the sister-in-law of the King of Italy who permitted the arrival of Mussolini, by her first marriage, by her second marriage, she became the sister-in-law of Count Carlo Sforza who had married Valentine Errembault de Dudzeele, one of my grandfather’s sisters. Count Carlo Sforza was the minister of the Foreign Affairs and Ambassador, but he resigned because of Mussolini and had to leave Italy for Belgium, the country of his wife. He became the leader of the Italian Anti Fascists during the WWII. She died prematurely when I was a baby. I discovered your website with the photo of my grandmother because I was looking for stuff about my mother who had been in the Résistance during the WWII in the “Réseau Comète.”I didn’t find her, but I found your site. Last funny thing …Many historians think that my grand grandfather was the unofficial father of Hergé’s father and uncle and it would be the reason why Tintin has a lot of adventures in the Balkans. Thank you so much for sharing this story with me. After “just” 100 years the document comes back where it belongs to – to your family. Congratulation and all the best. This passport belonged to a Belgian fellow collector, who found it once in Paris at a stamp dealer shop, I made then the article about this beautiful travel document.